The different Nioxin cleansers (hair loss shampoos) belonging to different Nioxin systems are gentle shampoos designed for different types of thinning hair. 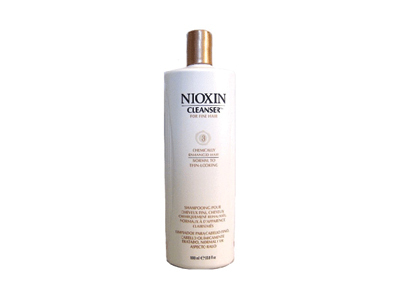 Nioxin Cleanser System 3 is perfect for fine, chemically or color-enhanced hair in the early stages of hair loss. The shampoo for thinning hair minimizes the excessive hair loss experienced on a daily basis as it gently cleanses the hair and scalp and eliminates build-up, residue and DHT(Dihydrotestosterone). Nioxin Cleanser System 3 improves the appearance of thinning hair and it protects the scalp from drying or irritation caused by chemicals. Meanwhile, the hair loss shampoo also helps prevent color fading with Glyco-Color Shield. BioAMP thickens the hair from inside the cuticle and Transactive Delivery System moisturizes the scalp and hair using a time-release delivery system. Apply Nioxin Cleanser System 3 to wet hair. 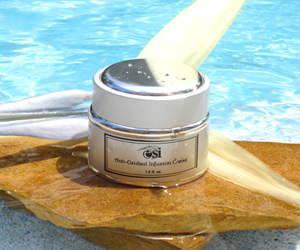 Follow with Nioxin Scalp Therapy System 3 and Nioxin Scalp Treatment System 3. Aqua/eau/water, tea-lauryl sulfate, sodium laureth sulfate, hydroxypropyltrimonium honey, cocamidopropyl betaine, cocamide mea, dimethicone propyl pg-betaine, acetamide mea, panthenol, hydrolyzed keratin, glycoproteins, polysorbate-60, polysorbate-80, cinnamidopropyltrimonium chloride, cystine bis-pg-propyl silanetriol, glycol stearate, peg-150 distearate, propylene glycol, polyquaternium-4, lactobacillus/eriodictyon californicum ferment extract, lactobacillus/olive leaf ferment extract, lactobacillus/wasabia japonica root ferment extract, camellia oleifera, foeniculum vulgare, mentha piperita, panax ginseng, polygonum multiflorum, rosmarinus officinalis, simmondsia chinensis, vitis vinifera, phospholipids, lecithin, hydrolyzed algin, acetyl cysteine, acetyl glutamine, alanine, asparagine, aspartic acid, histidine, ornithine hcl, tris-oleoyltromethamine ethane sulfate, ethoxydiglycol, saccha romyces lysate extract, coenzyme a, pantothenic acid, pyridoxine, cyanocobalamin, biotin, folic acid, niacin, thiamine hcl, ubiquinone, phenylalanine, tyrosine, dimethyl isosorbide, saccharomyces/copper ferment, saccharomyces/iron ferment, saccharomyces/magnesium ferment, saccharomyces/silicon ferment, saccharomyces/zinc ferment, melanin, superoxide dismutase, tetrasodium edta, citric acid, ci 42090/blue 1, phenoxyethanol, methylparaben, propylparaben, methylisothiazolinone.